So when time is cramped and you still have so much to do, everyone goes into Hyper-Crabby Mode. As well as the Get-Sick Mode. On Monday, I attended a REAL DEAL Cricket game! It was the fifth day of the game (Americans would not like the patience required for that game!! 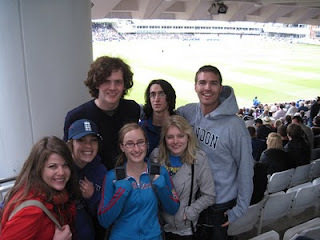 ), England v. Bangladesh, and when we arrived, we thought we weren't even going to get into the stadium. It took us 15 minutes, of speed-walking/light jogging to get to the end of the line. YES, the end. Then we were required (in a way) to stand in that line for another 45 minutes as everyone purchased their tickets. As we stood in line two new friends, Steve and Dave, explained to us the rules of Cricket. A Wicket is an out, but a wicket is also one of the little wooden things they're trying to knock off the stumps. When you're batting, you're defensive in the way that you're protecting the wickets, but offensive because you're the only one who can score runs. When we finally arrived in the stadium and sat down, though, we realized it was way simpler than the rules make it seem. The next day was long. But fantastic. We'll leave it at that =). It was a day of class forever. WEDNESDAY we visited the Royal Courts of Justice, only to sit in on the shortest court case ever. Honestly. I'm pretty sure this post will take longer for you to read than it did for us to sit in on the case. One of the judges laughed silently through her hands at the irony of it all. So then, we decided to venture to the CANDY SHOP! Which I love. I don't have any photos of it, so I will have to bum those off of my friends and then post them to my web album! Next, we arrived at the National Gallery. Oh my stars. Da Vinci, Monet, Manet, Gainsborough, Turner, Rembrandt, Boucher, Van Gogh, ... and hundreds more that I either didn't recognize or I can't remember. It was outstanding! And a maze. We definitely allll got lost. From there, we visited Covent Garden, and then went home for the OPERA! Oh man! The opera was definitely over-the-top dramatic. But what else is to be expected? I loved it, although I don't think I'll be seeing any more operas during my stay here in London. Thursday? CANTERBURY!!! It is SO pretty there. We got a personalized tour of the cathedral (shown left) and it was probably the best tour I've had this whole trip. I learned so much and was totally interested the whole time! The best part about that cathedral is the Chapter House. It's this big open room with AMAZING acoustics. I went back in later with a small group of friends, and we hummed hymns. HAHAA not because we were trying to avoid thoughts, but because if we were singing them it probably would have been super messy with ALL THE ECHO. Quite a few people stopped and listened as we hummed, and smiled at us or mouthed, "That was very good!" as we left. But it wasn't the crowd that we were humming for; it was for us. We also went punting, which was beautiful and took my breath away! Literally. I had a huge asthma attack while on the little boat. But I just relaxed and focused on breathing, and the rest of the trip was JUST fine. Then... Poppy Day! I don't even know how to write about it. Okay, so we had class focused on the war. In the beginning of the week, they told us our assignment was to research the causes of the wars, which I'm pretty sure everybody did. Haha such good students we have here! So we discussed the wars in class, and listened to music connected to them. The tone was very reverent, and everybody was reflecting on the hardships that many had to go through. It was almost like a slap on the wrist! We all grew very grateful. Saturday is a special day it's the day that you go to... ABBEY ROAD! It was VERY COOL being there. We were able to cross a couple of times, trying to get ideal shots. The whole time we were just giddy. "We're where the Beatles walked!!!" We spent the rest of the day shopping and attending concerts. Family, I bought something individually for each of you. London souvenirs, per say, but not ones that SCREAM London. They more-so scream YOU. I have decided that when I get home, I will have a powerpoint slideshow for my family of my adventures, and then we will watch that film so that I can show them everywhere I've been. YAY! !